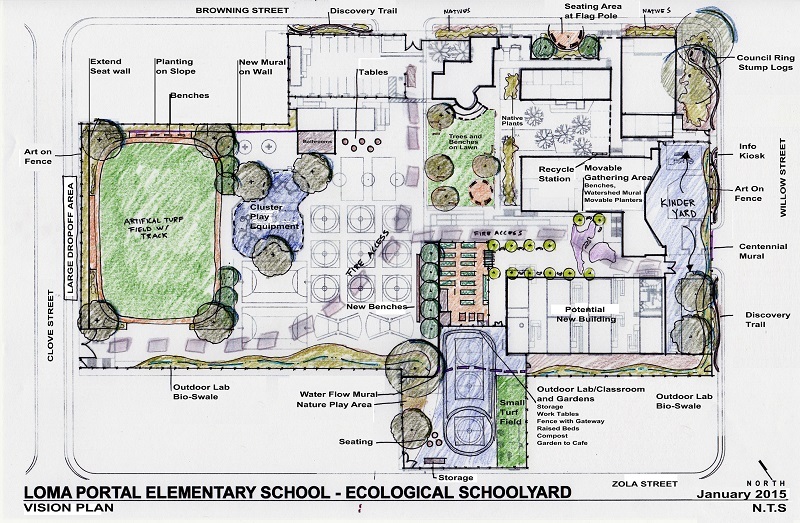 Since late 2013, Rooted In Place, along with a group of dedicated volunteers have been working with the Loma Portal Elementary School Community to develop an Ecological Schoolyard Vision Plan to enhance the play, learning, and environmental quality of the school. The goal of the Vision Plan is to create a road map for making changes to the current asphalt dominated schoolyard into a ecologically healthy and stimulating outdoor play and learning environment for the students, teachers and the community. Located directly in the storm water corridor between Point Loma and the San Diego Bay, this schoolyard holds great ecological significance for the area. It is also one of the oldest schools in San Diego, celebrating it’s centennial in the 2014/2015 school year. From design workshops, user surveys and meetings, valuable information was collected from the parents, teachers, students, staff, the district and the site to better understand the needs and issues of the school. The sum of this analysis, a Vision Plan was created for the Ecological Schoolyard. The Vision Plan seeks to enhance the overall ecological quality of the schoolyard, promote healthy and dynamic play, while supporting hands-on project based learning. The first project(s) will begin in the Spring of 2015. After a year of input from the students, teachers, staff and school district, a Vision Plan was created for prioritizing improvements to the campus.